Rainbow and Clouds for Dessert! 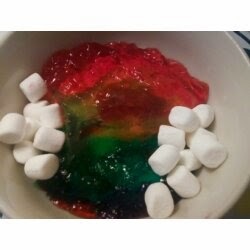 Anyways all you need is 6 packages of jello and a lot of patience, it took me a day of waiting and making jello to create this dessert. Start by making the first package of jello, I started with purple to create the perfect rainbow. Let it set almost completely before starting the next package in a separate bowl. Let the second package cool but not set and then pour it on top of the first layer, which should be almost completely set. Repeat those exact steps until your rainbow is complete! And then use some mini marshmallows or whipped cream for the clouds.